We've had a great time at this cabin! We rented a fishing boat and went out on Lake Fontana. That was nice. We also took a couple of the mountain biking trails. Mouse Branch was a real adventure!! We started at 7 pm so we barely made it back before dark. Our visit was short but it was a wonderful get away time! Would love to come back. The house is loved by all of us here. We can not find the words to express our feelings. Good! Great! Wonderful! Perfect! Magnificent! Everyone says we will be back. We spent two days here and had a wonderful time! All my family loved it here. We hope to stay here again. The cabin is comfortable and the hot tub was great. We loved the cabin! Great Place for a family trip. Perfect weather and beautiful cabin. This is our 2nd time staying in your home. Thank you for sharing with u. Having the dock for our boat. and kayaks is wonderful. We having to Fontana for 7 years and this is one of our top homes to stay in. Thank you. We loved the cabin. Everything was just perfect. We will come back soon. It was Simply Outstanding. This place is stunning. We have done a lot of relaxing. The porch is wonderful. We went down to the town and shopped around. Also to Cherokee and Smoky National Park. The view is stunning. One of the most beautiful mountain cabins that we have been to. Thank you for the memories. We Loved the cabin it was just perfect. We will come back. Simply Outstanding. Visiting from Yorkville AL and Sarasota FL. I can't imagine a more peaceful and comfortable cabin that Sun Eagle. Thank you for sharing your cabin with us. Everything was wonderful. I don't know if the mornings or the evenings were better in this cabin. Views are stunning and when a storm moved in it was magic. We come back weekly if we could. The view from the house can not be put into words! The kitchen is so well stocked. We enjoyed every minute of it as we soaked in all of the splendor of this area. We loved the cabin it was just perfect. We will come back soon. It was simply outstanding. We really enjoyed our stay at Smoke Rise. The view is absolutely breathtaking. It is a lovely cabin. We had a lot of firsts on this trip. First big family vacation. We just love Bryson City and Nantahala. Check out the Filling Station Shop in Bryson. You will not be sorry that you did. If you want to take a fishing trip look up Kyle with Fontana guides. Thank you for lending your home to us. This was an awesome vacation. We went Zip lining, rafting and loved Soda Pop's. It was a very comfortable cabin we loved the view from the hot tub. Amazing!! We loved every minute of our stay here! Beautiful views. The cabin was very comfortable and had everything we needed. Definitely will be back. What else can we say about Bear Hug other than it is amazing. We were so excited upon arrival at the breath taking view and how cozy this cabin is. The must see places were Mingo Falls in Cherokee and falls in Deep Creek. Our favorite this to do was drive around and enjoy the views. Make sure to stop by Anthony's in Bryson the pasta was great. Great Cabin. This place was breath taking. Very relaxing. We loved the views and can't wait to come back some day. We had a very nice stay. There was great scenery and our cabins was very cozy and well kept. What a beautiful cabin! Everything was perfect from the dcor to the views. 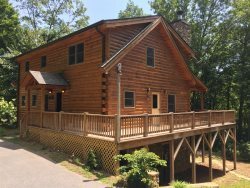 Our family had a wonderful time roasting marshmallows, chasing fireflies and enjoying everything that this cabin has to offer. Thank you for giving us a wonderful home base to come back to every night. WE road tripped in mini vans. The weather was perfect while we were here. We had so much fun there wasn't enough time to do everything. Which was fine with us, it means we have to come back. My husband and I brought our youngest 3 children here for a summer vacation. The cabin is so beautiful. The kids loved the yard and having the board games, tubing, hiking and lots of walking thru the "Wheels of Time" It was well worth the trip. This has been an amazing vacation. We hope to come back again next summer. Today is our 20th Anniversary and our last day. We had an amazing and romantic time. This was a beautiful romantic getaway! this was our 2nd honeymoon. Everything was clan and perfect for our weekend. Thank you so much. We will be back. Kelita was a delight to work with. It is always difficult getting somewhere to stay while traveling on motorcycles in the mountains, due to winding and gravel roads. She led us to the perfect destination. We absolutely enjoyed ourselves. There were other cabins in the area, but it felt like we were miles up in the mountains. Unless you can do something about the rain (haha), I wouldn't change a thing. Everyone I spoke with was extremely helpful in finding the right property for me and my family. The property exceeded all of our expectations. It was immaculate and had every amenity you could ask for. It was a high end beautiful house that slept our family of 6 adults extremely comfortably.